Narcissa Niblack Thorne began collecting miniatures as a young girl. Her fascination grew and as an adult, she gained world-wide recognition for hundreds of miniature rooms created with such exacting detail that they became educational tools for students of architecture and interior design. Today you may visit the Art Institute to view the fascinating permanent collection of 68 Thorne Rooms which continue to bring a sense of wonder and amazement. Thorne Rooms are also in the permanent collections of the Phoenix Art Museum and the Knoxville Museum of Art. Sally Sexton Kalmbach is a fourth generation Chicagoan whose family founded a coffee and tea company in the early 1880s, at the same time Potter Palmer was developing Chicago's Gold Coast. Sally has taught classes in Chicago history at the Newberry Library, and has given numerous speeches and customized tours for individuals and small groups. Her expertise and ability to present material in an accessible, yet informative manner have resulted in a loyal following. 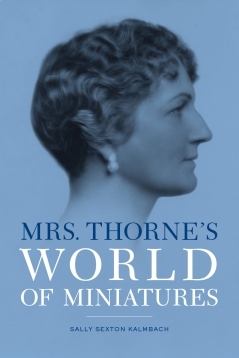 Her topics include: Chicago's Gold Coast; Revisiting the Columbian Exposition of 1893; Mrs. Potter Palmer's Gold Coast; Women and the White City; Mansions and Millionaires: The McCormickville Walking Tour, offered by the Driehaus Museum; and Mrs. James Ward Thorne's Miniature Rooms. Sally is a board member of the Chicago Chapter of the Society of Architectural Historians, a volunteer docent at the Charnley-Persky House Museum, and a fund-raiser for Opportunity International, which helps underprivileged women start their own businesses.